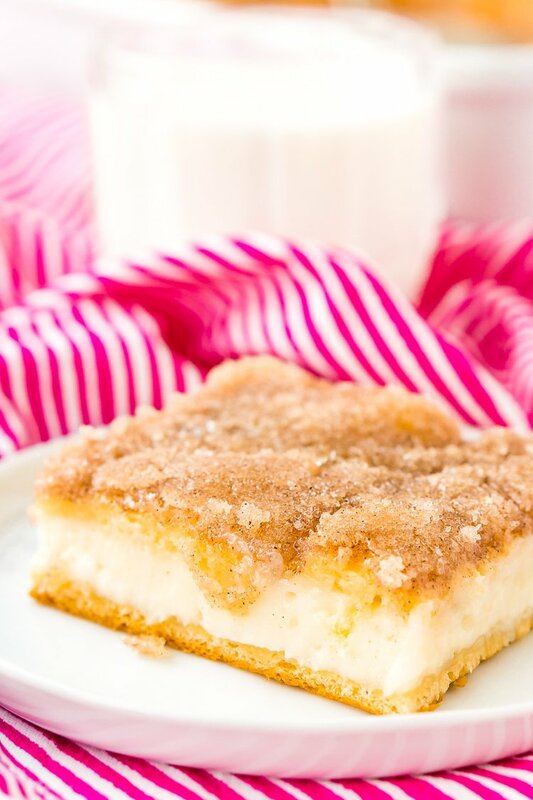 Sopapilla Cheesecake is a Spanish-inspired dessert made with crescent roll dough, cream cheese, cinnamon, sugar, butter, and a drizzle of honey. What do you get when you mix a Spanish-inspired pastry with smooth and creamy cheesecake? 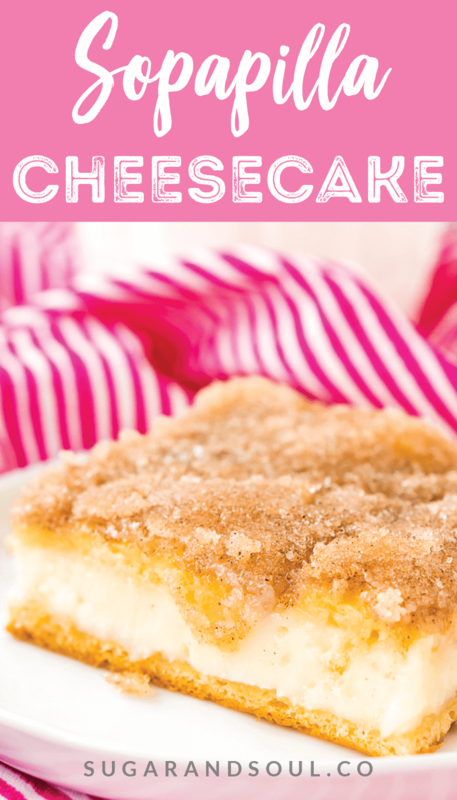 A scrumptious recipe for Sopapilla Cheesecake that will have everyone coming back for seconds! The best part is, this cheesecake is probably the EASIEST cheesecake you’ll ever make! 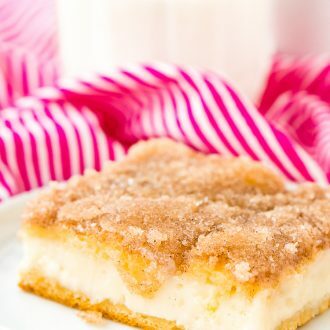 No water baths, springform pans, or ridiculously long cook and cooling times, just a simple and delicious dessert recipe! Sopapillas are a traditional Spanish dessert, a fried dough treat that look like little pillows and are coated in a crust of cinnamon and sugar. They are believed to have originated in New Mexican a few hundred years ago but can be found in many countries in Central and South America. Now, imagine that stuffed with a smooth cream cheese filling and topped with a bit of honey, and you have the essence of Sopapilla Cheesecake! I love cheesecake and cream cheese frosting, so naturally, I had to try this recipe, which has its own cinnamon sugar twist! And, I’m happy to report that it’s as yummy as it sounds. The base and topping of this dessert are two flattened sheets of crescent roll dough. In between each layer is a filling of cream cheese, sugar, and vanilla that’s blended until smooth. 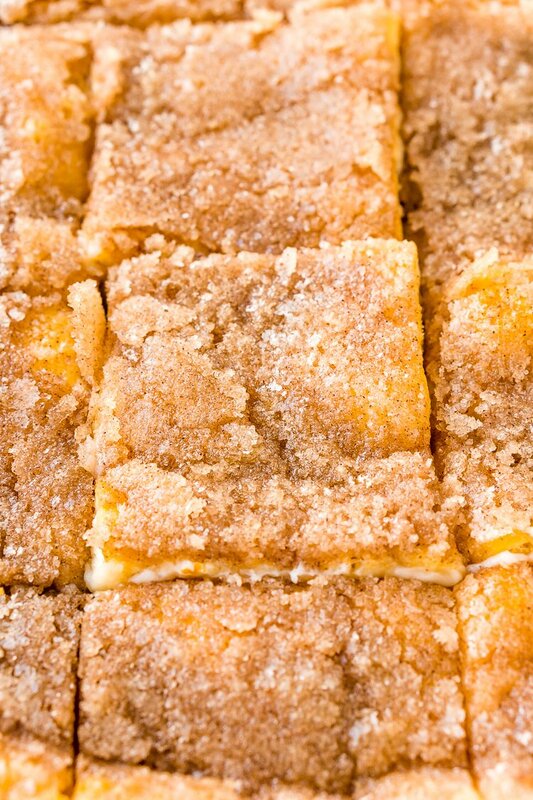 For that true sopapilla taste, the dish is topped with a mixture of butter, sugar, and cinnamon. Once it melts in the oven over the golden brown dough, it forms a sweet crust that’s absolutely irresistible. A drizzle of honey is the finishing touch on this Sopapilla Cheesecake recipe. You can even serve it with a refreshing scoop of vanilla ice cream to compliment all that sweetness! 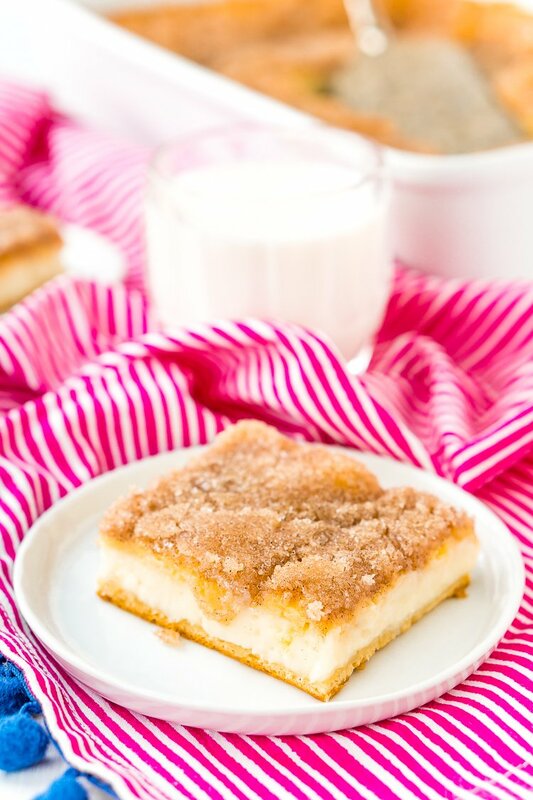 These easy-to-make Sopapilla Cheesecake bars are perfect for company, potlucks, or parties. Of course, there’s always the option enjoy this decadent dessert with the family at home! By the way, there’s no wrong time of year to make this delicious recipe! It’s a crowd-pleaser at summertime cookouts and barbecues, but it’s also full of warm cinnamon spice that’s perfect for cozy fall evenings or winter holidays. Inspired by two classic desserts, Sopapilla Cheesecake is a crispy, creamy confection that’s full of cinnamon and sugar goodness. Make this for celebrations, get-togethers, or just for yourself! 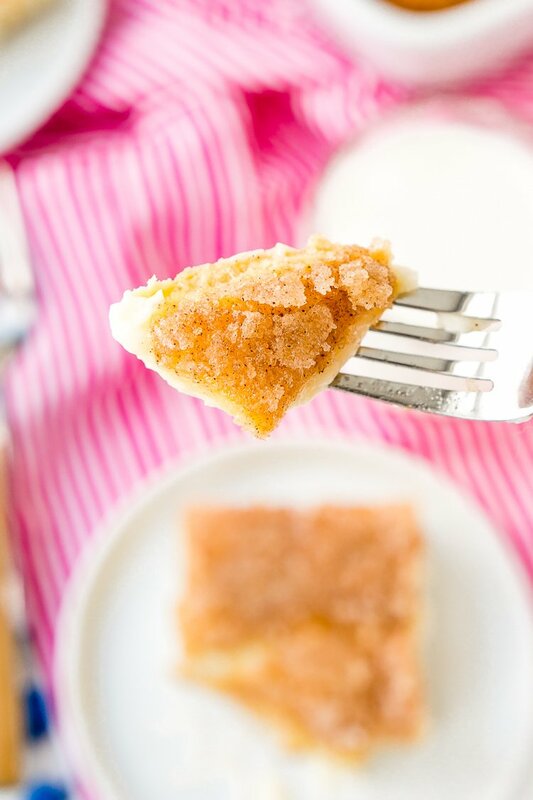 Pin this Sopapilla Cheesecake for Later! Preheat oven to 350 degrees F and grease a 9x13-inch baking dish with cooking spray and set aside. In a large bowl or stand mixer fitted with a whisk attachment, beat the cream cheese, 1 cup of sugar, and vanilla together until smooth. Unroll the cans of dough and use a rolling pin to roll them out so they are approximately 9x13-inch in size. Press one of the rolls of dough into the bottom of the prepared baking dish and pinch together any seems. Top the dough with the cream cheese mixture, making sure to spread it evenly over the dough. Top the filling with the other piece of dough. Cream together the butter, sugar, and cinnamon and dot it over the top of the dough. You can leave it dotted or use a rubber spatula to evenly (and gently) spread it over the top of the dough for a more even coating. Bake for 30 to 35 minutes until the top layer of dough is a golden brown and has puffed up. Remove from the oven and drizzle with the honey. Allow the cheesecake to cool completely in the pan before slicing and serving. Should be served with chilled or room temp. Nutritional Information is a per slice estimate based on 15 slices. Oh man this is my kind of sopapilla! So good and flavorful! All my friends love this cheesecake I make 3 at a time best dessert I ever made!